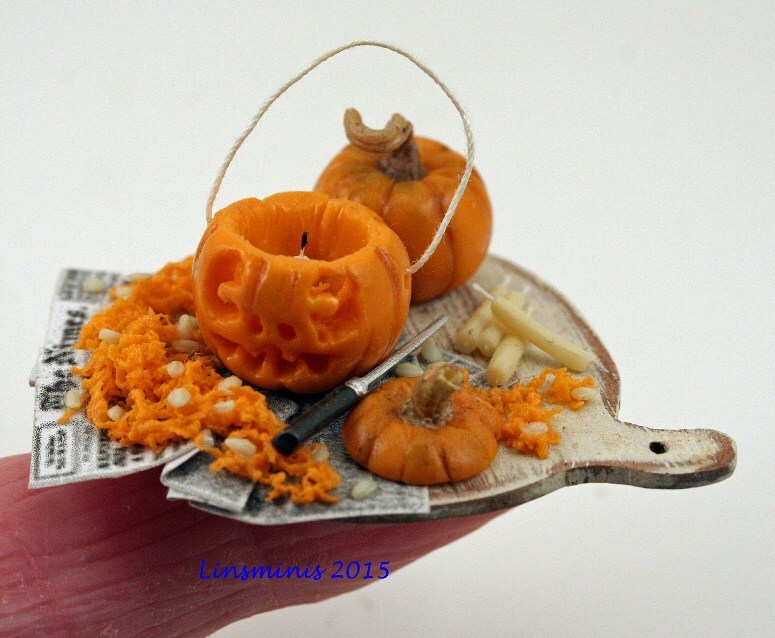 #Halloween in #Miniature 2015- 5 - Happy Halloween! 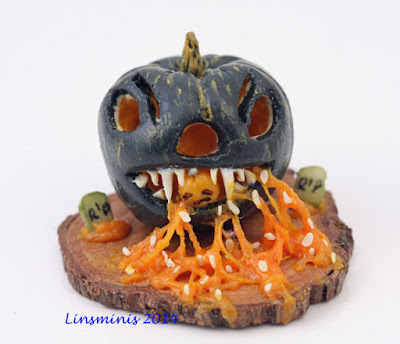 * Today is Day 5 of Halloween in Miniature 2015! 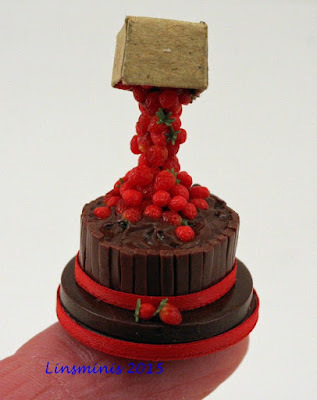 I hope you enjoyed the stories and miniatures from this year's contributors. Here's a little more about them and their work. 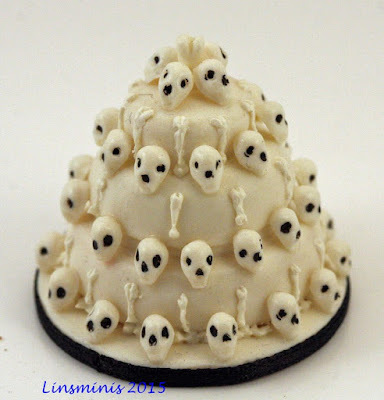 * Patricia Paul is well known for her unique and spooky miniatures, along with some other amazing creations. She also is a Fellow with the International Guild of Miniature Artisans (IGMA). Visit her on Pinterest or on Facebook. 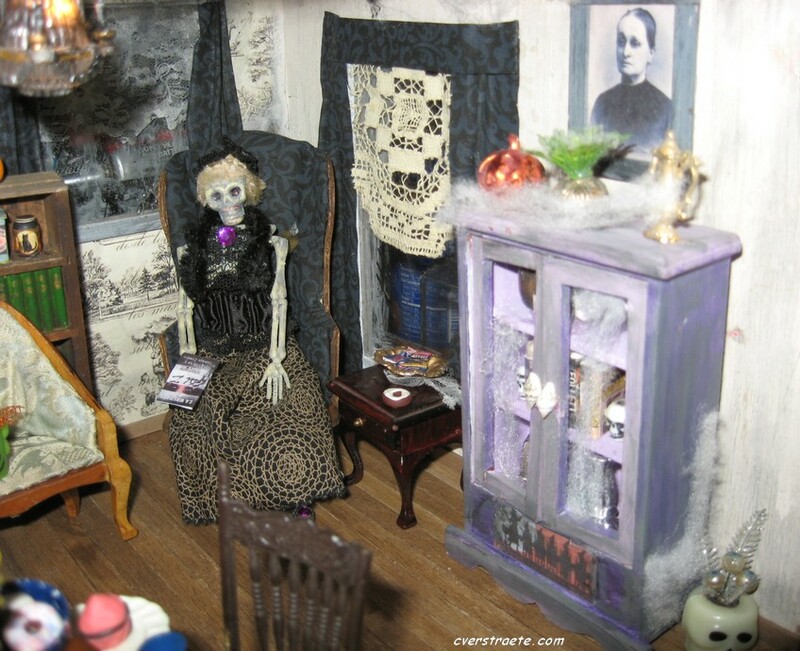 I have interviewed Patricia before, including in last year's Halloween in Miniature. Patricia has been working in miniature for over 35 years and first made her a son a haunted house when he was nine. "That is where the skeletons started," she says. "He was fascinated with skeletons and so the house had to have one. And of course, Harry Potter books were a big deal around here and we got the books as soon at they came out and saw all the movies. 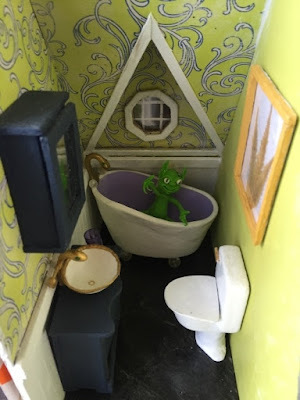 Which is why I have a miniature Leaky Cauldron." These days, with the kids all grown, she's admitted to doing some clearing out. But she still has some favorites. "I have tons of Halloween decorations and I have a special fondness for pumpkins for some reason and have a pumpkin collection, which is odd, I know. (Also a miniature pumpkin collection.) 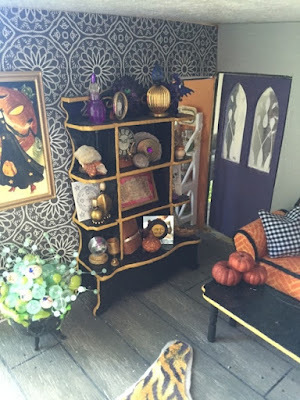 I don’t do much decorating or celebrating Halloween since my kids are grown. It was really painful when they lost interest around their teens, I can tell you. 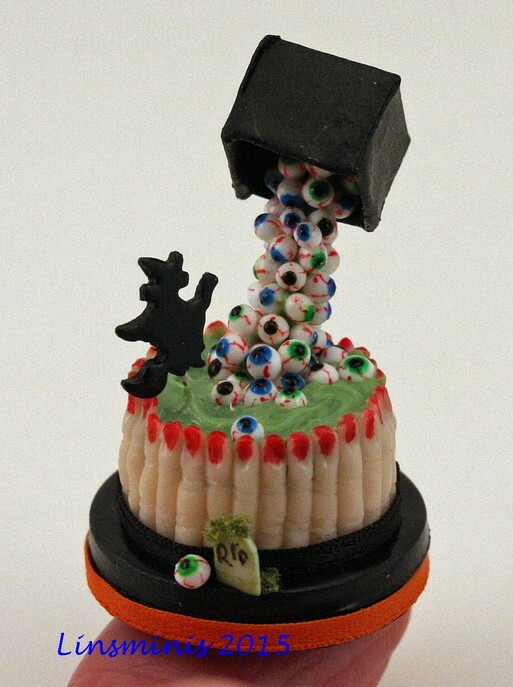 And I just recently packed up a bunch of Halloween decoration items for The Salvation Army. Also painful. Everything I’ve ever let go of has claw marks on it, and Halloween stuff is particularly difficult. But I can’t keep everything. I just noticed a storage room I have in the basement is full of Halloween stuff. Which is staying." 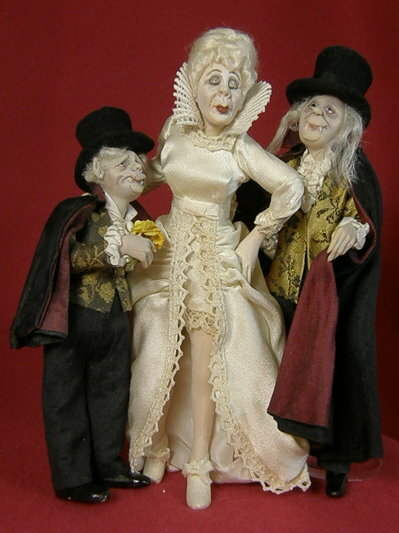 Her own collection includes a family of Vampire dolls by Kay Shipp. She says, "I would love to do a roombox for them. I have an empty castle front box or an empty radio case that looks like a gothic something or other might work. It could also become The Room of Requirement from Harry Potter fame. Pile of wizardy stuff dusty and aged sounds like a fun project. I keep making things and then selling them, so I have nothing left for my own projects. But, there are plenty of talented people out there I can collect from." 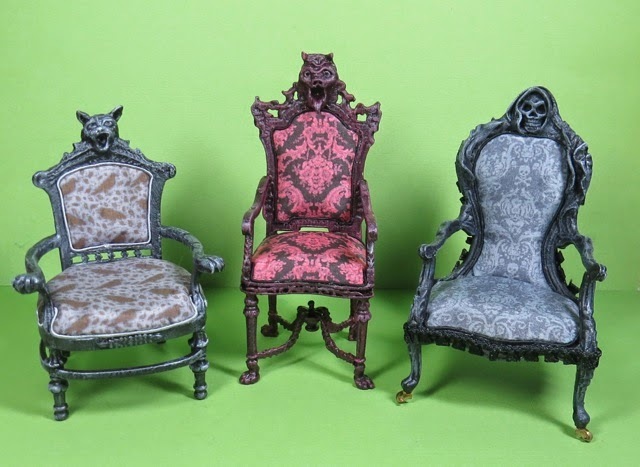 Her current projects include some cool haunted furniture with sculpted gargoyles and skulls, and some upholstered with goth/haunted fabrics of her own design. * Joanna Campbell Slan is known for her fun Kiki Lowenstein mysteries (the latest is Shotgun, Wedding, Bells (A Kiki Lowenstein Scrap-N-Craft Mystery Book 11) the and Cara Mia mystery series and short fiction. She also loves miniatures! Check out her Pinterest page. Joanna really enjoys the creative end of making miniatures. She likes seeing what she can do herself. It's always fun seeing what she came up with, or what she's used to make something else! I love the colors (and the creature!) 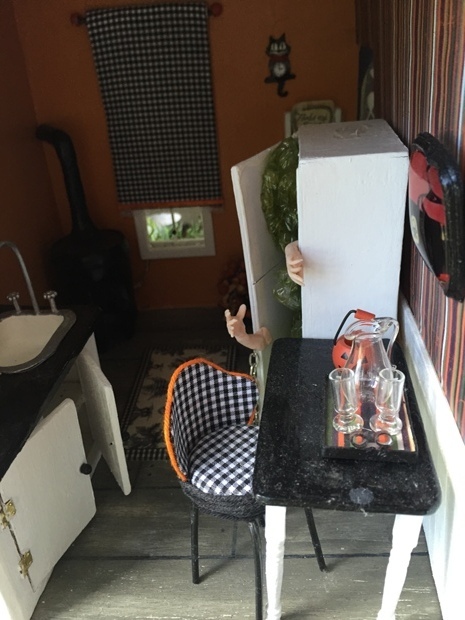 in her miniature Haunted House. She's also created a fun Valentine's project and was recently working on a surfboard shop. See her blog for more photos. 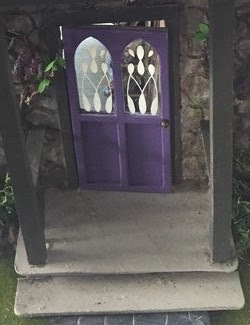 What's interesting is that the Haunted House is Joanna's first official house, even though she's loved miniatures since she was a child building fairy houses in the base of an oak tree. 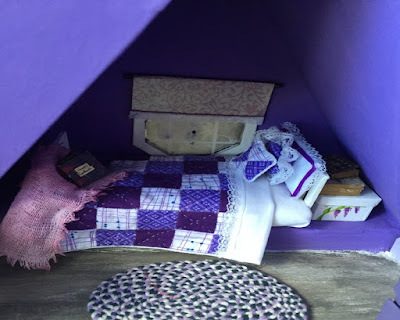 But even then her creative streak was evident: "I dragged home an old TV console and tried to turn it into a dollhouse, but my parents tossed it out. Then my first husband made one, but it was pretty rudimentary, and I did do a little in the way of making bread dough food, but I didn't dare tackle furniture. Then my current--and FINAL, forever--husband bought me a huge dollhouse, which I sent to T & D dollhouses to have electrified and furnished, but I never really got to play with that because real life intervened. We moved to a smaller home and had to sell that one. I was so sad." She's now making up for it with her recent creations and having a blast doing it, we might add. 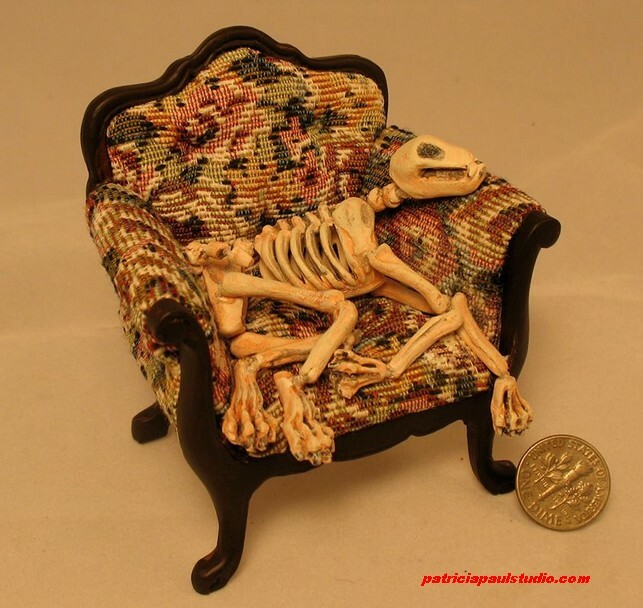 * UK dollmaker and IGMA Artisan Julie Campbell has been making her delightful, hand-carved polymer clay miniature figures for over 14 years and gets better each year! I especially enjoyed her take on actresses Bette Davis and Joan Crawford from my favorite movie, Whatever Happened to Baby Jane? See photos here. Read more about Julie in a past magazine interview I did - see Belle link on my website Miniatures page. I love the whimsical expression on her witch's face! 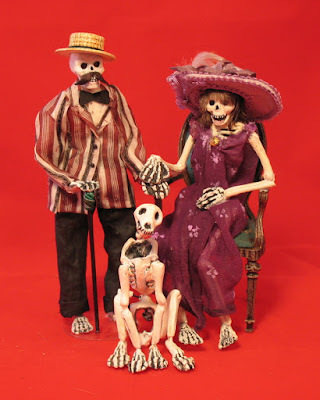 Nancy Cronin is another favorite miniature dollmaker who makes her own hand-sculpted figures. She certainly has a way with the spooky figures. Check out her assorted ghosts and witches! 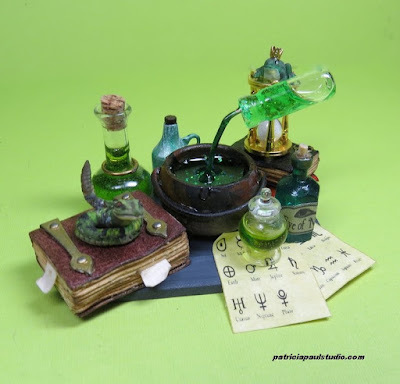 Christine Verstraete loves making miniatures and writing about them. She's had articles published in various newspapers and magazines, both in the miniatures field and elsewhere. She also is author of In Miniature Style II, (in print and ebook) which includes profiles of various miniaturists and photos of their work, along with more than 40 how-to projects. Her first ebook, In Miniature Style now has a new cover and is on Kindle. 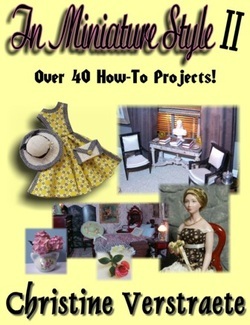 It includes a selection of projects not included in the second book. 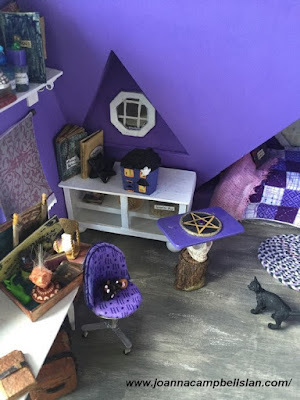 Here is a photo of the partial living room of the small Haunted Cottage she just finished. Also done is a Fortuneteller's Room made in a small greenhouse. More photos will be published soon. She is now working on a half-scale garage and yard sale. 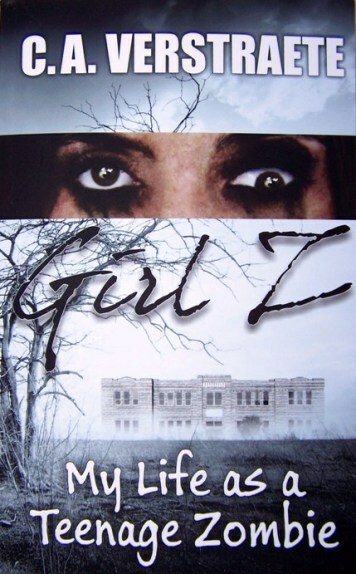 ** Christine also writes short fiction and is author of the young adult book, GIRL Z: My Life as a Teenage Zombie by C.A. Verstraete. I couldn't help it and stepped back, glad Carm wasn't around to see my reaction. (where'd she go, Lake Michigan? ), the more nervous I became, especially when Spence twisted around and gave a low moan. His fingers twitched. He kicked out a foot and made a funny low growl. I slid back a few more inches to put some distance between us and wondered what was taking her so long. "Carm?" My attempt to lean backward and peek through the doorway made me lose my balance and bang my arm on the doorframe. I staggered, ending up where I'd started. From the corner of my eye, I saw something move and jumped. I turned and took a sharp intake of air. Spence and I gazed eye to eye. He sat up, made another unintelligible growl, and grabbed for me. I screamed and yelled, but he stared straight ahead and right through me as if I wasn't there. My heart pounded so hard I swore my shirt fluttered. I panted, becoming more frantic, as he scratched and clawed at me. "Spence, stop-stop!" I yelled. "Carm, help!" The minutes felt like hours. I didn't know how much longer I could keep him at bay when my cousin ran in and yelled. 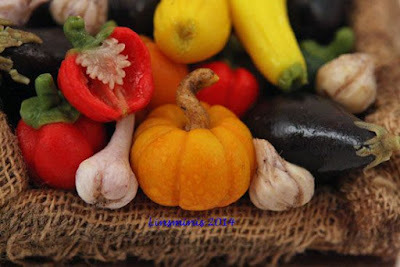 ** My character Becca is also in a new short mystery, "The Almost Ruined Thanksgiving," which will be published in the November issue of Mystery Weekly. Sign up for the free newsletter to read the story. *** Check the website or the GirlZombieAuthors blog for updates!! Thank you again for stopping by this year's Halloween in Miniature event. 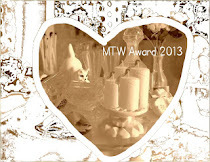 Come back next year and be sure to stop by my other blog and website above. 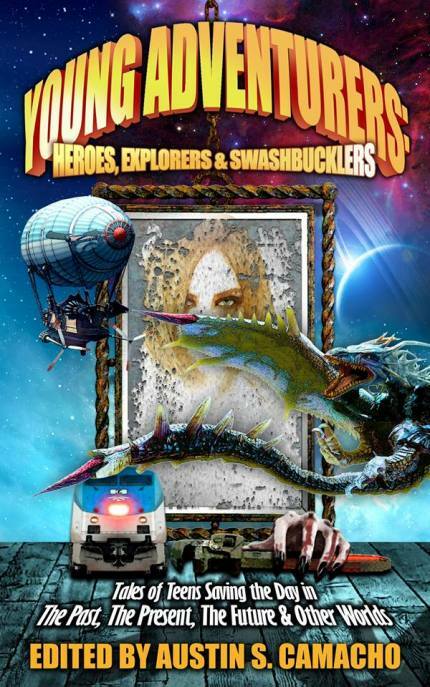 Here's an excerpt from my story, "Puppy Love and Zombies" coming in Young Adventurers: Heroes, Explorers and Swashbucklers. Pre-order Nov. 1! See website. Most of us had been too busy surviving, and trying to avoid the roaming hordes of ravenous undead, to notice something else was going on. Yeah, like the rest wasn't bad enough? It was, but this new thing nearly did what the mutated Z virus didn't already do—kill me. The morning started great when my Uncle Franco brought this beautiful, year-old white German Shepherd puppy over for us to meet. Unlike my first dog experience (more on that later), the puppy bounced around, played, barked, and most important, didn't make me afraid. Call it love at first lick. I begged and begged, though I knew my Tia (Spanish for Auntie) Imelda already loved her as much as I did. Then we heard the yells outside. My uncle's cries of “look out!” came too late. My cousin Carm opened the door and jumped back at sight of the chaos in front of our house. Our neighbor Mr. Thompson screamed, “go back in, shut the door!” as two of the zombies came at him. In the last few months, most of the full Zs had been rounded up and exterminated, but a few wanderers like these kept us on our toes—at least they should’ve. My uncle grabbed his gun and fired at the monsters. The excitement was too much—the puppy panicked and pulled out of her collar. I screamed as she darted out the door and ran off in the opposite direction. “NO-NO!” I yelled and tried to catch her, but she was gone. I would've followed if not for the strong arms of my cousin and aunt holding me back. ** Get the book to find out where Fluffy went and what's happening to all the dogs! Is it zombies... or something worse? 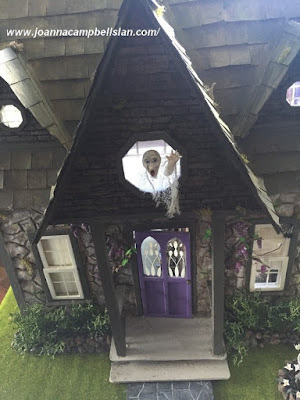 Today I wanted to introduce you to some talented artisans who enjoy putting a "little" scare in their miniature work and who contributed to this year's Halloween in Miniature 2015! 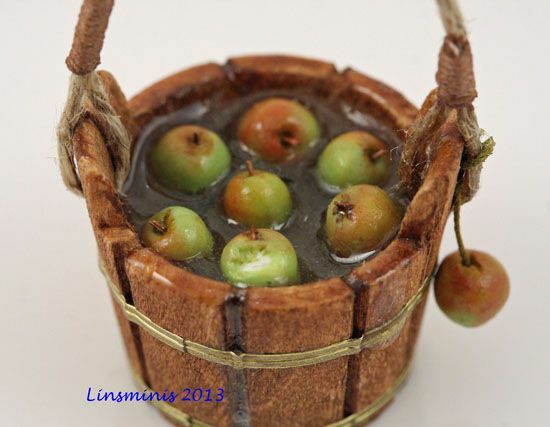 Linda is a Fellow with the International Guild of Miniature Artisans (IGMA) who sells her minis under the name Linsminis (and Linsminiartform.) 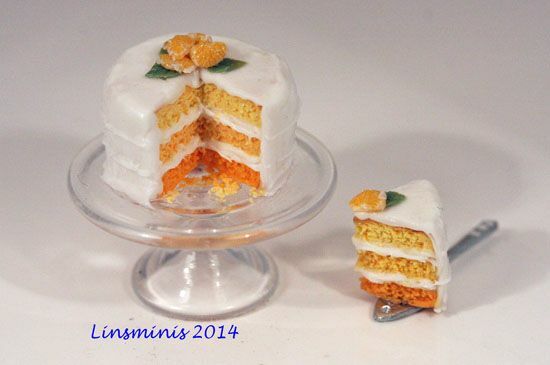 Check her Etsy shop (http://www.etsy.com/shop/linsminis /) or see her website, www.linsminis.com. You can see more of her work on her Pinterest page. While she was home watching the kids and her husband was working nights at the nightclub they owned and ran for over 20 years, Linda eventually began looking for something else to do once the children were in bed. Linda works with “the usual materials” - polymer clay, air dry clay, artist’s pastels, wood and linen threads for the baskets. 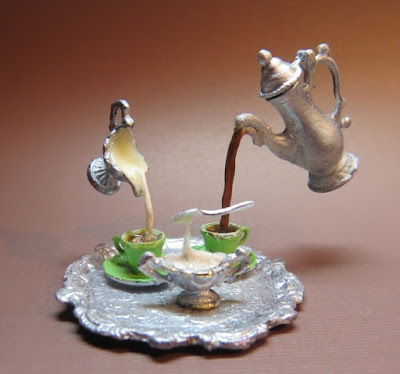 She says what she likes best about working in miniature is the detail. And if she had to pick a favorite miniature (or two), what would it be? So Mercy had to find another way into heaven, and she would have to use the very last drop of essence to do it. But first she’d have to break another commandment or two. She’d settled on ascending tonight. Mercy had started toward town shortly after dawn. It wasn’t a far trip, but she moved so sluggishly that she had to give herself enough time; she couldn’t risk using up the essence to speed her step. She headed toward Highway 7, not to visit the churches, which on this Friday would be empty, but to go to the drive-in theater. For Mercy’s magic to work, the sky would have to be as black as coal . . . and that accursed theater with its big screen was right where the land was the flattest. She needed the flattest parcel on which to make her approach to heaven. She’d enjoyed movies here during previous summers, sitting at the back of the lot and cloaking herself in the essence so no one would demand she pay the five dollars to watch. She’d mentally made up her own dialog and music, as the sound from the little tinny speakers didn’t reach that far. The theater was the smallest of Kentucky’s remaining drive-ins. At the height of the country’s drive-in theater craze, there’d been roughly one hundred and twenty places like this in the state—one for every county. Now there were only a dozen or so left, and unfortunately one of those happened to be between Mercy and the hereafter. There were eighty spaces—she’d counted them a handful of decades past, and they’d never been added to, though the proprietor had managed to squeeze in a hundred cars and pickups the first night they showed “Titanic.” It had never been so busy since. She reached her “sitting spot” shortly before sunset, settling on the ground where the weeds were neither particularly high nor scratchy. Two cars were already here—filled with young people lost in each other’s arms. She had plenty of money in her pocket in case someone from the tiny concession stand spotted her and came to demand she buy a ticket. By dusk there were only twenty cars—plus the old motorcycle the theater owner/projectionist drove. There was a bicycle, too, and that belonged to his only employee, a boy too young to have a driver’s license. Twenty cars . . . they would not take too much of the essence, and that was a good thing. Fortunate no splashy new release was playing tonight—that would attract more. Mercy knew it wouldn’t be too many more years before this drive-in closed on its own accord, but she didn’t have time to wait for that. She would help it along. She didn’t have the energy to walk farther and find an equally flat piece of ground miles west in the county. It was ascend to heaven right here, on this clear, cloudless night . . . or rot in hell. The first feature started while it was still too light to see it well. It looked to be a comedy, actors falling down, the occupants in the cars bobbing in laughter in response. She’d never cared for comedies, mirth was overrated. But she admitted to liking the overlarge picture with its glowing colors and gigantic faces. And Mercy liked this place. She breathed deep of it, sucking down the scent of buttered popcorn which she wished she would have purchased. But that would have given her away, and she hadn’t wanted to draw attention. So she called up a memory, of what the hot popcorn had tasted like on a summer night when she’d distracted the boy at the concession counter with her lightning bugs. It had been salty-sweet, butter thick on each puff, and she let that recollection satisfy her. Getting to heaven was more important that filling her grumbling belly. There were other odors—of the tall grass that grew at the borders of the lot, mingled with the fragrance of hidden wildflowers. It had rained earlier in the day, and so she also smelled the moistness in the earth. She thrust her fingers into the ground and relished the feel of it. Her mother was buried in the rich Kentucky soil, Mercy had seen to the task a dozen decades past when she first sensed the essence fading and knew what was left couldn’t be shared by two. The sky darkened when the second picture started. It was dark enough now. Behind her, she caught sight of lightning bugs dancing along the tops of the tall grass. She would need their help. Mercy shuffled toward the concession stand, the front part of which served as the projection booth. A thin, middle-aged man was at the counter, getting a refill on his soda; he paid her no mind and returned to his car. The boy behind the counter, though, he noticed Mercy immediately, eyes wide like a cat that had been spooked. He opened his mouth to say something, but nothing came out. She saw him work up some saliva. “Or I will kill you.” She drew herself up and set her shoulders back, fixed him with a menacing gaze for good measure. He looked behind him to two doors, one led outside, and the other to the projection room. He started toward the exit. The door slammed behind him and he hopped on the bike, the wheels made a crunching sound over the gravel. “There’ll be no more ‘tomorrow’ here . . . for me or this place.” Tomorrow, she would be ensconced in heaven. Mercy leaned against the wall and sent her senses into the ground, coaxing up some of its waning essence. There was so little left. Maybe other mountains held magic, the Andes, the Rockies, Himalayas, Cardamoms in Cambodia, Cherskiy in Siberia, Haraz in Yemen, Taurus in Turkey, or Knuckles in Sri Lanka. She had no means to travel to any of them, nor any desire to leave Kentucky and its Appalachians. But she had a desire to get to heaven. The essence would be everlasting there. Then she slipped in through the door, pausing to stare at the mound of buttered popcorn in the machine, shaking off the notion to sample some, and making her way into the projection room. The man hadn’t heard her approach, so wrapped up in the film he was watching through his small window, chuckling at the appropriate places. Mercy edged closer. She briefly thought about telling him to leave, but decided better of it. He might summon a sheriff’s deputy or foolishly stand his ground. “Slay him,” she said, so faint he couldn’t hear. 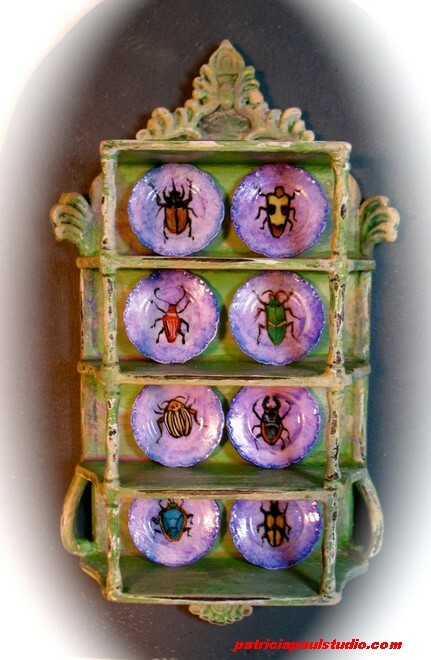 The cockroaches that had been hiding in the walls of the concession area swarmed him, the beetles, too, as well as the bees that had been roused from their slumber. The man writhed and screamed, and she reached forward and turned off the projector, then the lights in this room. Next she turned off the lights in the concession area and unplugged the popcorn machine and the dispenser of sweetened ice. Cars started honking, people shouted for the movie to resume, headlights came on. Mercy stretched out with the essence and drained all the batteries. She needed it to be wholly dark. She stepped outside and embraced the night, glancing up to see the myriad stars, so many and so bright, with no headlights or movie screen or concession stand sign to cut their glory. Her hold on the essence was feeble at best now, and she was slipping away. Mercy envisioned herself falling down into the bowels of hell to burn for eternity. The lightning bugs complied, spreading out and hovering above the ground among the cars and the legs of the movie-goers who had gotten out to see what was amiss. She tried to shut out the chatter of the people as she shuffled toward the edge of the lot. The stars sparkling, the lightning bugs twinkling, God’s fireworks, all of it, she thought. Heaven come to ground. She couldn’t see where the stars stopped and her bugs began. “It is beautiful,” a woman perched on a car roof behind her gushed. Beyond the cars now, and the towering, dark screen, only the flashes of nature’s light filled Mercy’s vision. She pulled up the last of the Appalachian essence and stepped out onto the field, finding the doorway and slowly ascending. * Jean Rabe is author of a variety of books including, The Love-Haight Casefiles: Seeking Supernatural Justice . One of her latest books, Pockets of Darkness, is about mother, successful businesswoman, antiques expert - and thief - Bridget O’Shea. 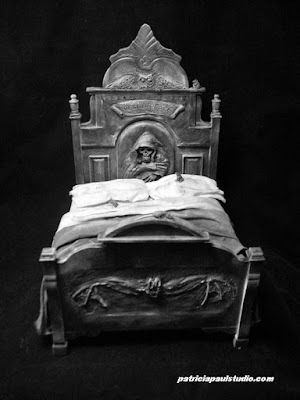 But when she steals an ancient relic from a Manhattan apartment, she acquires a curse in the form of a Sumerian demon. The demon wants something from Bridget, killing people she cares about to force her cooperation, and it will continue to kill unless she meets its demands. * Joanna Campbell Slan is also author of the Kiki Lowenstein mystery series, including The Halloween Close Call (A Kiki Lowenstein Scrap-N-Craft Mystery Series Short Story #10) . Welcome to Day 2 of Halloween in Miniature 2015. Today's story is a little longer. Author Jean Rabe. She's known best for her work in science fiction including the Dragonlance series and some of the Rogue Angel books, but she's written in a variety of genres, including some creepy, spooky stories. I tried my best to get the essence of this story in the pictures... A good word since that is what this featured story is all about. Mercy Grace Flannery hadn’t done the right things to gain her entrance to heaven. While this hadn’t concerned her during the first two hundred years of her life, it was weighing heavy now. Mercy was dying. She didn’t have cancer or heart disease or any other particular ailment that doctors at the Letcher County Clinic would be able to slap a diagnosis on. Mercy was simply running out of “essence,” and there wasn’t enough of it left in the land to sustain her. When she was born in 1789, outside of Jeremiah, Kentucky, the essence was thick, ribbons of it writhing in the earth and waiting for anyone with the proper skills to harvest it. Mama Flannery had schooled her daughter early on in how to use it, and Mercy had wisely never passed the knowledge along to anyone else; sharing was not something she practiced. But she did practice often with the essence. The magic—the essence—in the great Appalachian Mountains made her strong and kept her looking like a woman of twenty summers for nearly two centuries. But the presence of more people settling in the mountains—coupled with the miners who dug into the earth’s belly and the tourists who came in droves to ogle the scenery—weakened the essence, the pristine nature of the earth, and thereby weakened her. Now Mercy Grace thought she looked every one of her two hundred and twenty-two years, skin as gray as ash and deeply wrinkled like the bark of an ancient sweetgum, hair as wispy as a spider web, gait as slow as a slug. Maybe she’d spent too much of the mountains’ essence through the decades clearing patches of ground for her garden—magically coaxing beetles to churn the dirt and grasshoppers to eat only the weeds. She siphoned off more than she should have on her crops to get magnificent yields, calling bees to pollinate everything. She’d given her animals longer lives and greater intelligence, her cabin warmth in the winter and coolness in the summer, and she’d used the essence to slay and bury the increasing number of poachers and hikers and lookee loos who’d traipsed onto her property and stuck their noses where they didn’t below—the insects acting as her assassins. No one would find the bodies, as she’d used the essence to bury them so deep that they could never be recovered. It was those murders that worried her the most; they’d tainted her soul pretty dark. “Thou shalt not kill,” she said, her voice as soft as a feather. It was a struggle to speak these days. She also worried about the “thou shalt not steal” directive, as she’d done that on a regular basis during the first century or so—clothes from the little shops in town, along with a nice assortment of baubles for her neck and hair; she had a fondness for things that sparkled. She’d never been caught, used the essence to see to that, entrancing the clerks to look the other way, momentarily entranced by a pretty butterfly. And she’d used it to sometimes empty their cash boxes so she could buy her a fine dinner at the town’s only restaurant. Up until the past few months she’d been stealing from the convenience store on Highway 7, which stocked a variety of liquors, potato chips, and iced chocolate cupcakes. 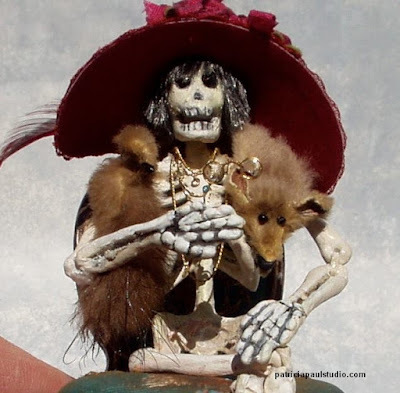 She had once coveted things that had belonged to a neighbor, and eventually made said neighbor “disappear” so she could expand her property and acquire his possessions. A large nest of hornets had helped with that. She’d taken the Lord’s name in vain every day of her life; cursing was something she’d never been able to shake. While Mercy had never married, she had enjoyed dalliances with men who were such . . . though none of that had went on since she’d started to turn gray. That didn’t make her adulterous, and so she figured she was safe on that one commandment. But as far as the Sabbath went? She certainly hadn’t kept that very holy, and so she was morally and religiously in trouble on several levels. There was a heaven, Mercy had learned that early on through the essence. And so she was pretty certain there was also a hell. Since she had no desire to go to the latter—and was assured to make the trip if she let nature take its course, she knew she would have to do something soon to find her way to those proverbial Pearly Gates. * Jean Rabe's latest works include The Love-Haight Casefiles: Seeking Supernatural Justice about lawyers Thomas Brock and Evelyn Love crusading for the rights of OTs—Other-Than-Humans. 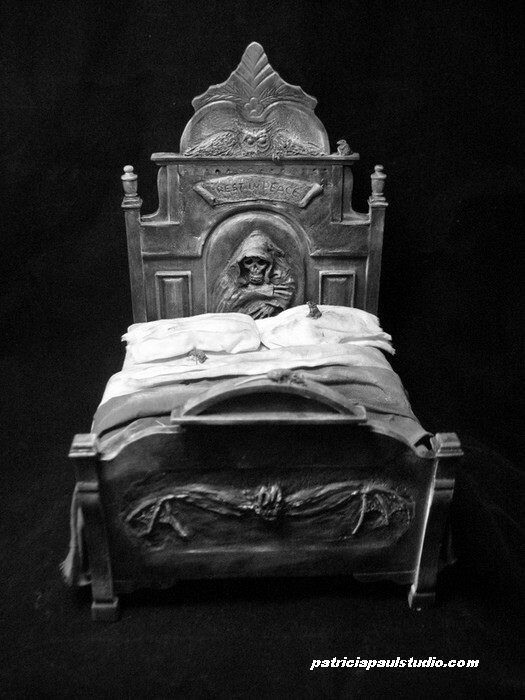 Their clients include ghosts, gargoyles, vampires, and things that have not yet been given names. The city’s OT element is sometimes malevolent, sometimes misunderstood, and often discriminated against. Brock and Love represent them, whatever the case, whatever the species. * Joanna Campbell Slan is also author of the Kiki Lowenstein and Cara Mia mystery series. She is also contributor and editor of the new anthology - Happy Homicides: Thirteen Cozy Holiday Mysteries ; see details. - Oh, and it includes a story about a dollhouse. New AIM Miniatures Magazine Now Out! Halloween in Miniature - Coming Soon!